Sakit pileg jang soedah lama dan jang baharoe, sakit tatoeq, sakit radang derri boeloeh-hoeloeh di-mengobati sampoerna dan sama sekal oleh: Antjoeran Pautauberge jang bekin koewat paroe-paroe dan menegahken sakit tombal (tuberculose). Parijs dan segalla roemah obat. 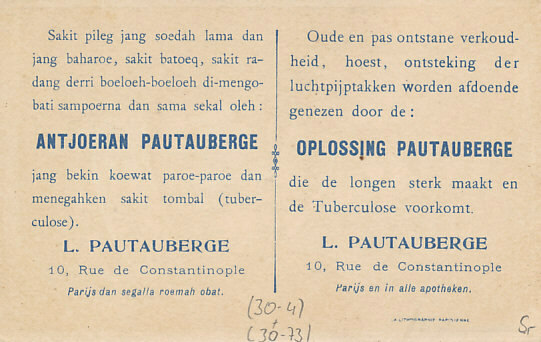 Oude en pas ontstane verkoudheid, hoest, ontsteking der luchtpijptakken worden afdoende genezen door de: Oplossing Pautauberge die de longen sterk maakt en de Tuberculose voorkomt. which strengthens the lungs and prevents Tuberculosis. French General Robert Nivelle was given command of the French Second Army in April 1916. He continued his rise to prominence in the Battle of Verdun after the Germans had suspended their siege, recovering ground and forts lost earlier in the year. In attacks on October 24 and December 15, French forces under Nivelle retook Verdun's outer forts of Douaumont and Vaux with light casualties, in part by using creeping barrage tactics developed earlier in the year in the Battle of the Somme. 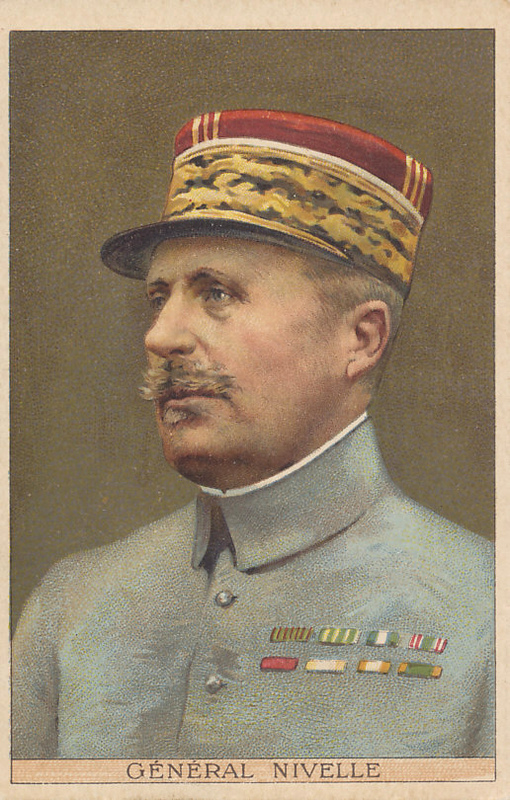 After his success, Nivelle claimed to have found the secret of victory in executing his tactics on a grand scale. France's terrible losses and a lack of confidence led to the government ousting Joffre as army commander and replacing him with Nivelle in December 1916. Although his fellow soldiers were skeptical, both French and British politicians were supportive. Nivelle's English was excellent, and he so impressed Lloyd George that the Prime Minister temporarily put British forces under Nivelle's command to ensure their support for his offensive. 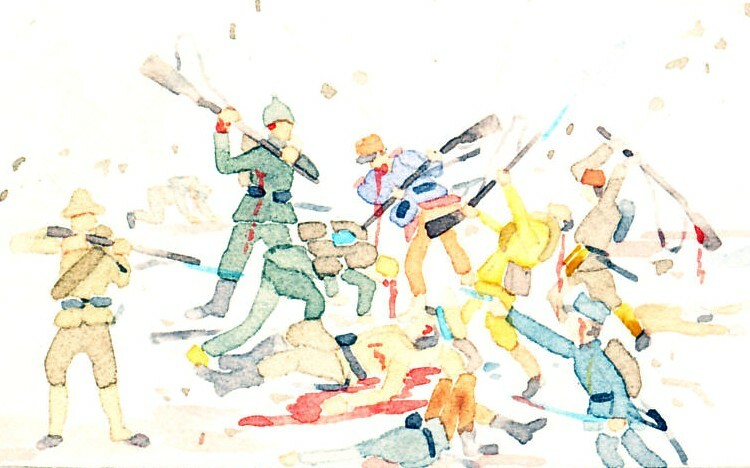 Nivelle's plan called for three coordinated attacks, one by the British at Arras, a second by the Canadians at Vimy Ridge, and a third a week later by the French at Chemin des Dames. The initial attacks were intended to draw German reinforcements from that at Chemin des Dames. Despite the German strategic retreat in Operation Alberich that reconfigured the front line a month before his offensive, Nivelle made few modifications to his plans. Begun on April 16, 1917, Nivelle's Offensive, was an immense failure, and led directly to the mutinies that struck the French army. On May 15, 1917, the government replaced Nivelle with General Henri Philippe Pétain.